Having grown up in Norway, my father was surrounded by fjords teaming with fish. In his youth, he often supplied the dinner table with his catches. I remember his stories about battling giant codfish and salmon with envy as I could only dream of having such experiences as a fisherman. These days, my fishing is more a state of mind than it is a sure thing, but it has taught me that one must be a tireless optimist and persistent in order to succeed. This approach may have carried over into how I work as a metal sculptor. I have been designing and fabricating lighting, sculpture and furniture for the past 12 years. I have learned much on the job, with each new project a leap of faith for me, and at times, for the client. Over time, I became more comfortable with the concept of not knowing exactly how I was going to design or build something. This fear of not having all the answers evolved into an energizing force, exciting me with enthusiasm and optimism, driving me headfirst into the project. Persuading steel into elegant forms is a process that requires a positive outlook and a lot of persistence as the path to completion is not always road mapped and there are many dead ends along the way. Most of my projects are smaller than 20 feet in length and weigh less than 1000 pounds, which I can handle, solo. As a sole proprietor, I wear a lot of hats, from salesman and designer, to shop foreman and installer I don’t have employees because half the time, even I am not sure what I am going to do next, making it difficult to direct assistants. But that all changed last summer when I landed the biggest job of my career. The owner of Legal Sea Foods Restaurants, a 30-location private restaurant chain, approached me to design and build a sculpture for his new corporate headquarters and distribution center in the Historic Seaport District on the Boston Harbor. 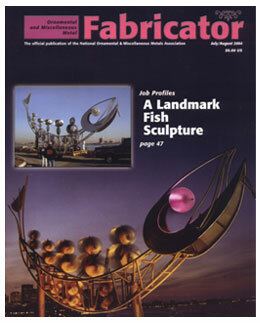 I had completed several projects for him over the past 6 years including a couple of 12-foot tall abstract fish sculptures, custom lighting, and two water features. He wanted a landmark sculpture that people could see from miles away in the harbor, even from planes landing at Logan International Airport on the other side of the harbor. Oh yes, and it also should be wind interactive to take advantage of the persistent winds that frequent the harbor. I was very excited and a little terrified; this was a very big challenge requiring solving both mechanical and aesthetic problems, something I would need a lot of help with. But first I had some problem solving to do. Over the next several weeks, I discovered that Boston is one of the windiest cities in the country. I researched the wind power industry to see the various types of wind turbine designs that I might incorporate into the piece, reviewed how other artists had made wind interactive sculptures, and dug through old patent drawings. I decided against using aerodynamic lift propeller type blades because of their high top-end rotational speeds with the potential to exceed 600 miles per hour as I was not making a giant blender. I wanted to use something less efficient, more peaceful, preferably something from yesterday’s technology. Then I found it: the Savonius rotor which drags along at a rotational speed of less than the acting wind speed; a rotor, with a history spanning thousands of years, from the early grain mill motors in the deserts of the Middle East to the water pump of today’s Australian farmers, seemed ideal, all I have to do is adapt it to my needs. The next question was what kind of fish should I depict? Should I use my favorites? Salmon? Tuna? Bass? More research led me to a book titled, “Cod, Biography of the fish that changed the World,” by Mark Kurlansky. It chronicled the importance of codfish, the one species, which fueled the economy of New England and was responsible for the early development of Boston and its working waterfront. I thought an abstract cod fish sculpture would be an appropriate landmark for the client and the historic seaport district neighborhood. Thinking about the design possibilities, I realized the sculpture’s prime audience is the many boaters who navigate the harbor. Commuter boats and recreational sailors would see this sculpture perched 40 feet above the water’s edge, and I began to think of ways to involve them. I proposed that the eye would somehow signal the wind speed in color, connecting the fish to its environment. I wanted to use architectural wash LED color panels to do the signaling but would have to find an electrical engineer to help me build the brain to control it, something I had to trust I would find. I decided the sculpture would be 45-feet long, made in three major sections for ease of transport with the largest part able to fit easily through the 10 foot by 10 foot rollup door of the shop. I still had to solve what it would look like. I filled pages with cod-like fish sketches and tried to distill them down into a simple abstraction. Most of my designs had the rotors on vertical shafts supported by the outline of the fish top and bottom and I wasn’t liking what I was seeing. Something my wife had volunteered kept coming to mind. She wanted to see the rotors almost floating with little visible means of support, something I initially thought was impossible but a few more versions, and I felt I was on to something which just might work. I made a 1-inch scale drawing and then a scale model in steel. Once fleshed out in the third dimension, I could see how the frame could act as a stiff support to cantilever the rotors high above the frame. I also saw some unexpected things. The curved belly had a ship’s hull shape and the rotors almost had a sail-like configuration, evoking elements of a Viking ship or sailing schooner that was unplanned, yet somehow appropriate. My client approved the design and released me to start fabrication and I prepared the shop for the materials and the work to take place. I hired a strong hand to move out all non essential tools and materials and help bring in the first loads of stainless steel pipe and sheet and to assist me in the pipe bending. By now I had data back from the two engineers I hired to specify the shaft diameters and sign off on the structure of the fish and its attachment to the building. We laid out the curves at full scale on the floor in preparation for bending. After a lot of head scratching, we started with the main frame nearest the tail so that the tail section, when completed could be test fitted while flat on the floor instead of standing 30 feet in the rafters. The sculpture could only be fully assembled at the site because it would be too large for transport so I had to be careful to assure that the parts would all fit together without ever seeing it together in the shop, now that was an act of faith. The arching body pipes were schedule 40 3 –1/2” pipe with an OD of 4-inches, weighing about 9 pounds a foot. We incrementally bent eight 20-foot lengths over the next 3 weeks, one inch at a time, with some pipe sections requiring over 250 hydraulic bends to complete. The tail section was completed next and test fitted into the rear, lower part of the fish and put aside. We continued to build the lower chords and combine them in a ladder arrangement by cutting 18” straight pieces and mitering them to accept the 3-1/2” pipe. I hired a full time welder so I could focus on the miter cutting. I had no idea how much work was in the miters. 12 vertical pieces had to be mitered to fit between the upper and the lower chords of the frame at set locations complicated by the fact that the pipes were not parallel or in line. Two weeks of miter cutting consisted of plasma cutting, grinding and test fitting, templating, and then more cutting, grinding and test fitting until it fit snuggly together. The manner in which the fish eye was going to communicate wind speed consumed my thoughts for weeks. I needed to somehow translate the wind speed into color. A sailor friend mentioned the Beaufort Wind Strength Scale, which is a numerical scale, invented in 1805 to describe wind strength based on visual cues. And because it is familiar to most sailors today, I thought it was fitting. I could program the eye to flash the number of the force, such that three pulses equaled Beaufort Scale 3 (7-12 mph). I hoped the pulsing eye would generate curiosity and over time people would learn what it conveyed via visits to the Legal Sea Foods website, where they could see the Beaufort scale and the fish sculpture in live motion on the web camera. The fish needed a brain to control the pulsing colors of the eye, so I inquired around Massachusetts Institute of Technology in Cambridge, and quizzed the LED manufacturer and anyone I could think of. I asked the firm that sold me the anemometer that I used to test wind speeds at the site, and they just happened to know an engineer who would be willing and able to meet the challenge. I sent him off to develop the wind to eye interface circuitry and program. I had ordered custom stainless steel bearings and precision ground hollow shafting for the rotor assemblies. I had the 30 inch diameter eyeball fabricated and all the LED panels and data/power supplies and hardware shipped. I also ordered the web camera and housing for the fish and harbor viewing via the internet, an idea suggested by my client. The site was prepared with amber lighting to cast a golden glow on the fish at night. I sited the webcam and housing on the roof and scheduled a crane company to transport the parts to the site for assembly. I was getting more nervous as the delivery and assembly dates arrived. Everything had to fit together and work on the first try. Four months of fabrication and I still hadn’t seen it assembled as one complete 45-foot long piece. The delivery day was a very gusty and rainy, raw autumn day. We unceremoniously crawled through Boston’s crowded streets making 5 trips in over 7 hours to the site 4 miles away. Now I was worried about the next day’s weather and how I was going to assemble and weld everything together in driving rain, I could only be optimistic and hope for the best. The next day was the most bucolic day one could hope for; it was bright, warm and calm. We welded the tail section to the frame while on the ground then hoisted the assembly to the stand on the flatbed trailer and attached the head on the first try. The owner’s representative, Lynette, said I cracked my first smile that day. My fears were slowly subsiding. The rotor assemblies were bolted to the frame while the local papers arrived for photos. The late day amber sun reflected off the completed sculpture for the first time. I heard that I smiled again. Halloween day, we backed the 2800-pound sculpture to the crane awaiting final lifting and welding into place 40 feet up overlooking the harbor. Another unusually beautiful day with no winds and warm temperatures added to the smooth installation. By lunchtime, champagne was flowing, and we had a dedication party on the roof with the company top brass and media attending. I felt like a proud sportsman with his trophy catch. The fish that fought me tooth and nail was won. Now, if only I could land a keeper striped bass.